Two Weeks to the Next Big Day! 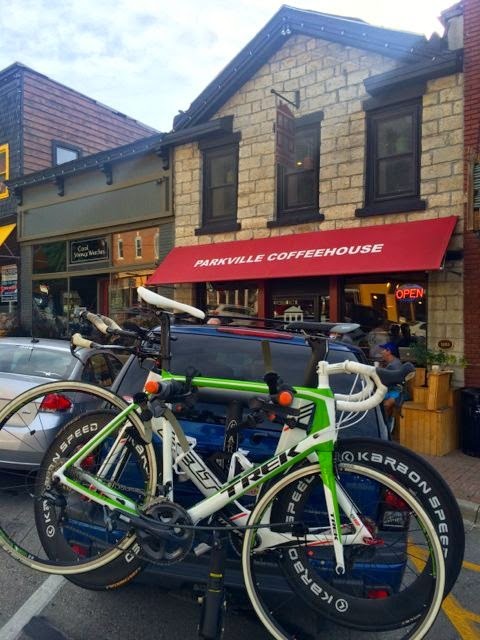 2014 triathlon season is officially in the books. "Winterzied" the Tri bike. 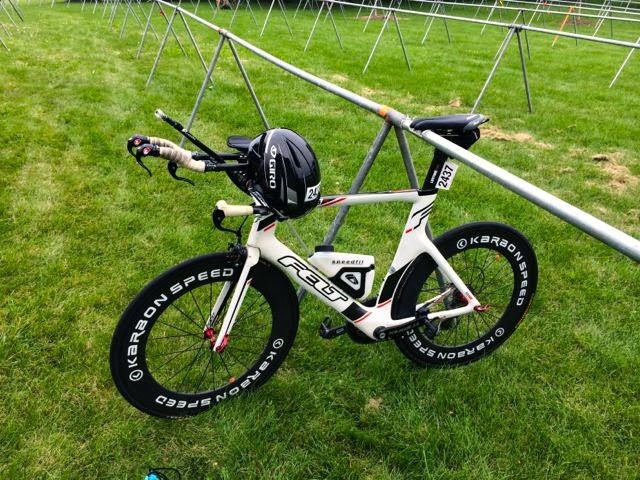 Basically reinstalled the stock wheels and put my normal seat bottle cage back on (took it off for the Chicago triathlon as I used my Speedfil system). Cleaned the 'transmission' as well! The doesn't mean I'm taking the rest of the year off. I'm planning to race the Kansas Half Marathon in November. I will be participating in the Bringing Up The Rear 5k or 10k. They added a 10k this year, so that is tempting and will probably be worth while given my Half Marathon training. I've raced this both years it has existed to honor Andrew Somora. In those two years I've done Bringing Up The Rear, I got 1st place age group in 2012 and 5th overall in 2013. The 10k was likely added because the park added nearly 2 miles of trails this year, making it easier to add the additional race. Technically, my registration day is Monday, September 15, which is a little more than 2 weeks. The week of Sept 8 is for people who qualify by 5 or more minutes. If there are any spots open after that week, then September 15 will start three days of of registration for everyone who qualified (no rush to register as it is not first come, first served). If there are still slots available after week 2, then on Sept 22 it will open to everyone who qualified again until it is sold out. The third week is first come, first served. They announced the fields size of 30,000 participants for 2015. From 2009 to 2013 the field size was 27,000. Last year the expanded it to 36,000 to allow for 5,600+ marathoners who didn't finish in 2013 to participate in 2014. I'm still expecting my 1 minute, 43 second cushion to standup and make it through the registration process because I would have made it every year so far and they even added 3,000 participants over the previous field size. I'm not sure when I will confirm that I got accepted; however, if on Sept 22 the registration re-opens, it's almost assured I made it since it is first come, first serve. Make sense? It's been awhile since I visited the blog. I've been busy working on some contract work, so the blog priority is one of the first to get dropped. 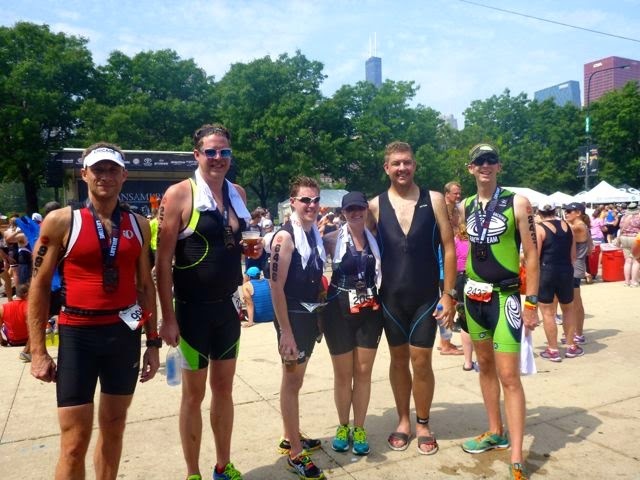 I'm finally back though to recap my "A" triathlon race, the Chicago Triathlon! I signed up for this as soon as registration was open in November. I had been planning to do the race this year but after buddy Erik mentioned it at last year's Head for the Cure 5k, it was cemented on the calendar. 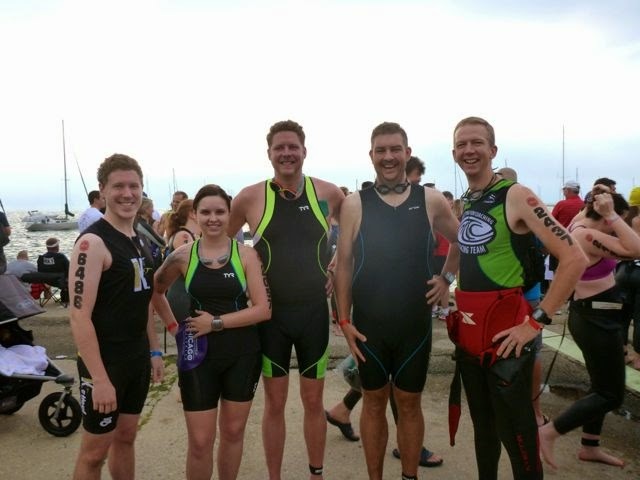 It was going to be Erik's first triathlon. The Facebook "calls" went out and soon Kyle (Erik's brother who I've raced with before and was at Beach2Battleship 140.6 as part of my IronSherpa crew), Catie, Rex (both from NC and have been involved in Brew-to-Brew recent years), JoeVI, and Kevin (one of my work triathlon buddies and recently raced at Kansas 5150 and KC Tri) were signed up. Erik had planned to do the Super Sprint on Saturday. 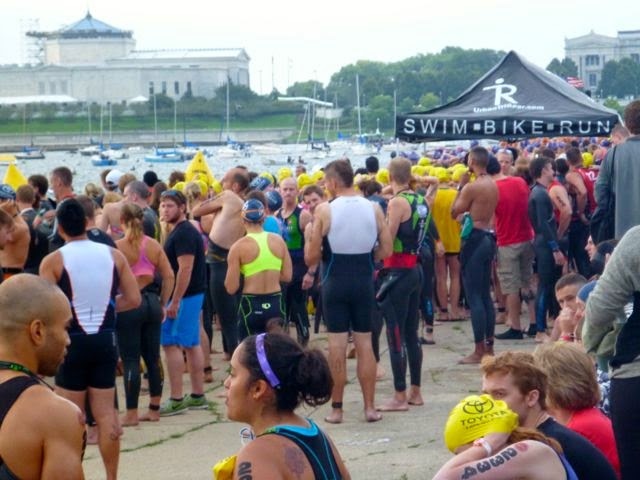 Given concerns I've heard about the swim, I did my diligence to recommend he participate in one triathlon prior to Chicago to get the taste of the multi-sport event and experience an Open Water Swim. Within 30 minutes of that message he signed up for KC Triathlon. 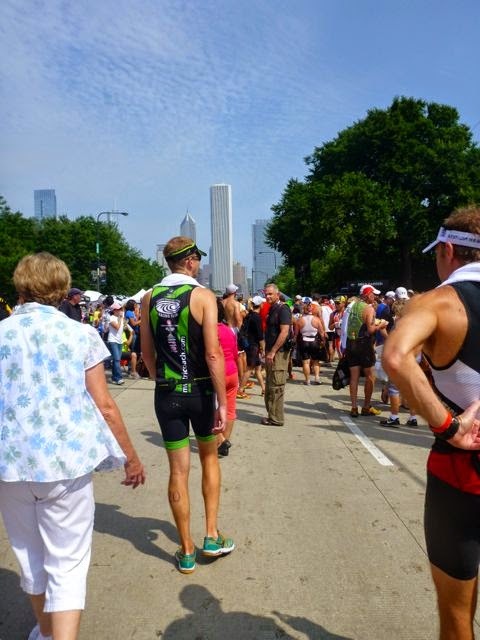 Soon after that race, Chicago Triathlon announced some amazing changes to the International bike course and he upgraded to the International division! I was so excited for him! I hadn't published any pre-race goals (re: first paragraph) and when people started asking me what they were, I said 2:15 without the rigorous research and calculations as I normally do. My PR is a tad under 2:19 from KC Triathlon this year. I figured 3 months of additional swim, bike, and run training plus better transition management could eek out 4 more minutes. Finally, after chatting with Erik I truly confessed my goals. I'm not concerned about a time goal. I'm looking for positions, specifically: Top 5 Age Group. After researching the previous year's races, I knew it was a possibility; however, you never know what a day in late August will bring. One last minute stop before heading towards Chicago! We left KC on Thursday. Unfortunately, JoeVI was absent in our travels. Work obligations got too much of him, which is understandable. Sometimes you need to be a responsible adult when you run your own law firm. I did my usual pre-race road trip menu with containers of pasta, smoked chicken, carrots, gallons of water, and Gatorade. 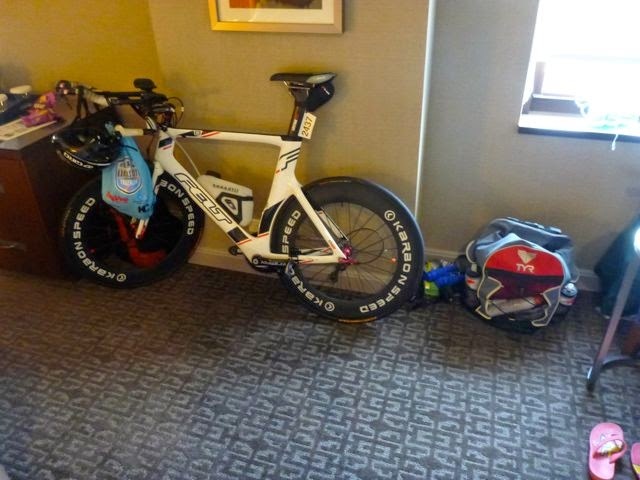 My bike getting cozy in the hotel room. After arriving in Chicago, we hit up Portillo's for dinner (famous for their hot dogs and italian beef). Friday TKB and I had breakfast after a 3 mile run along the Lake Shore trail. A bit humid, but beautiful morning! We ate at a nearby cafe and then met up with Catie, Rex, Kyle, Erik, Deb, and Paul (Deb and Paul are Kyle and Erik's parents) to walk the transition area. For lunch we went back to Portillo's so they could have some as well. Understandable, it's delicious; however, I grabbed some pasta from the Italian concept in the same building. We did a little more walking looking for a pie shop for TKB's Friday Pie but were unsuccessful. Soon we had to head back to the hotel for packet pickup. 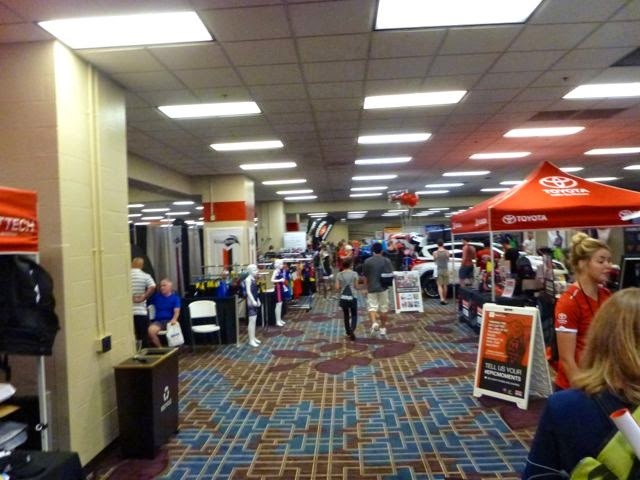 We attended the 3pm mandatory athlete's meeting and perused the expo, which was decent sized considering it was in the lower level of the hotel. I picked up some PowerBar Energy Blasts to use on the bike. They have the consistency of gummies that have been in your pocket all day. They are easier to chew than the Gu Chomps; however, you need to consume more of them for the same caloric intake. Enough bad sections on the bike course to make me concerned. Especially in crucial spots like exit ramps and sharp turns. With the race going through the underground, your eyes will need time to adjust to the darkness, even though it is lit artificially. 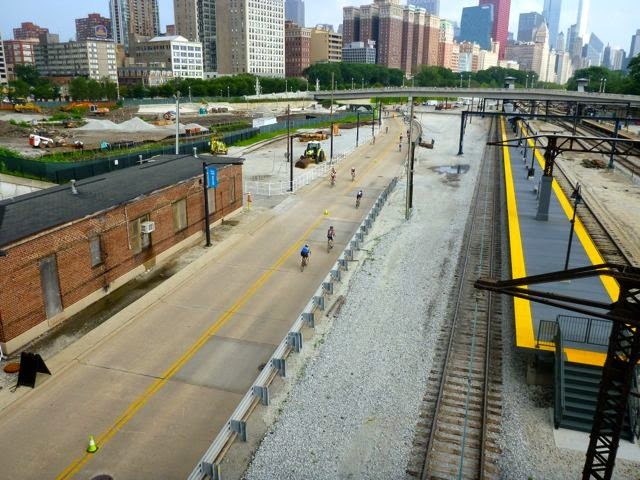 Lake Shore Drive will have two lanes for cyclists and two for traffic. Don't cross the orange cones to pass, which you needed to do on people's right since you were to ride on the left. Soon after we went to a house in north Chicago owned by Erik's relatives. Erik makes delicious BBQ and he had brought some up for a birthday party for Deb and siblings. I did my best to not go overboard on the BBQ. I managed just one plate, which was a success in my book. We got back to the hotel around 10pm and I went to bed to follow one of my key rules: Always get a good night sleep two nights before the race since you won't the night before. 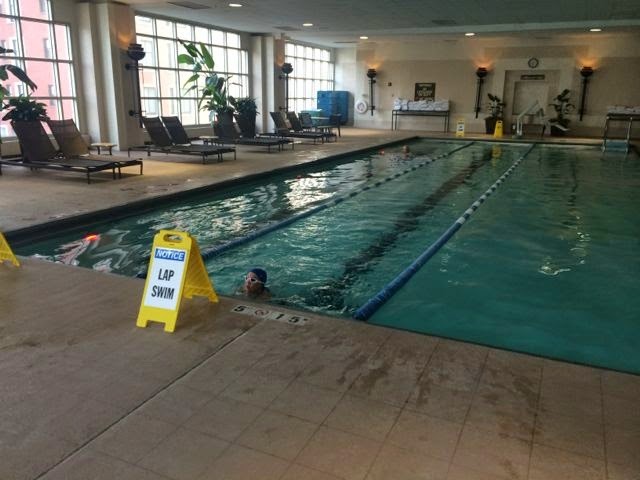 We got up around 6:45 and went down to the hotel's pool to get in a short 1,000 yard swim in the 20 yard pool. TKB and I met up with a high school friend and her husband at Yolk for breakfast. As we left, Kevin was walking up the sidewalk as he had just arrived from KC via airplane. I had couriered his bike from KC. We hit up the expo again for Kevin and Erik. Kevin and I dropped off our bikes at the transition area at 2pm. I was hoping to get a good spot as rack spots were assigned by wave number, not specific bib numbers as was previously advertised. Kevin and I riding over to transition. Wearing our helmets like good triathletes. As we were walking back, the skies turned to night! A storm was moving in and we got caught. We hung out at a Starbucks for about 45 minutes. Once it calmed down we continued our hunt for bananas, bagels, and yogurt. By now it was a little past 3pm and my parents had arrived. They had been on a two week long trip visiting friends that took them up into Canada. 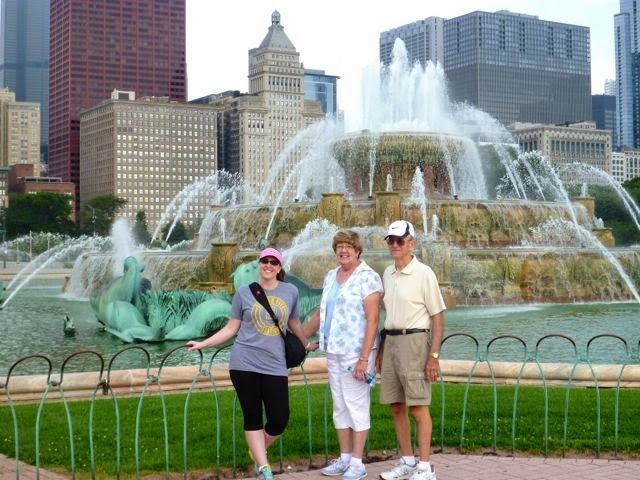 It was fortunate that their trip took them past Chicago to watch me race! All 11 of us (Erik, Kyle, Deb, Paul, Catie, Rex, Kevin, TKB, my parents, and me) headed out to Italian Village for the ceremonial pre-race pasta dinner. We got back to our hotel around 7:30pm and before we knew it, the lights were off. The alarm clock was set for 3:30am! Considering all the walking, my legs felt pretty fresh. 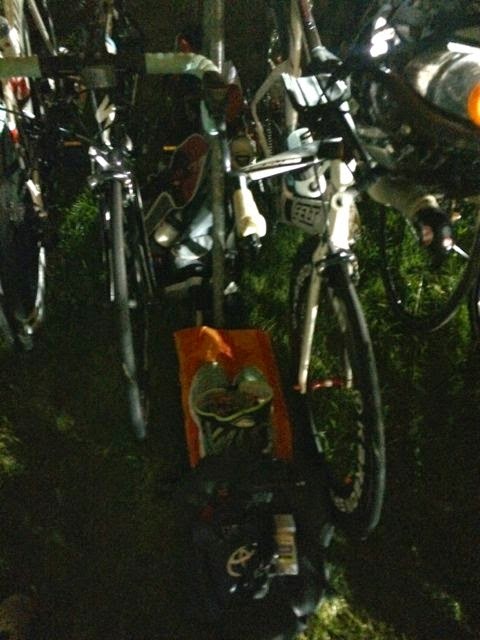 I met up with Kevin around 4:15am in the lobby and we headed over to transition with our transition bags. The transition area closed at 5:45. 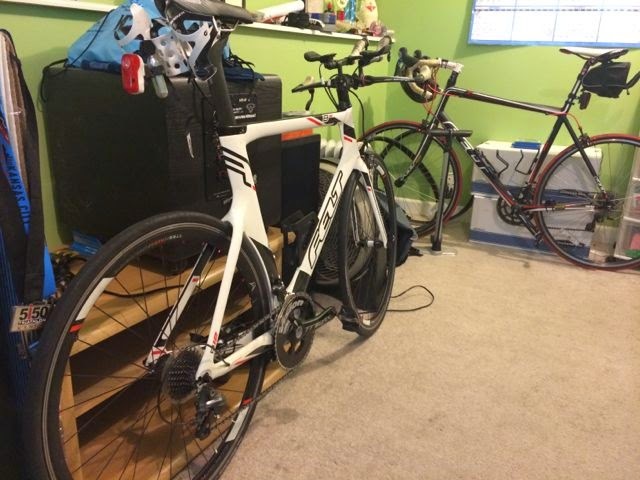 Even though my transition setup is so small with just bike, helmet, sunglasses, cycling shoes on the bike and running shoes, visor, race belt on the ground, it seems to take me forever to get it just right. I never did see Erik in the transition area, even though he was in my racking area (which was about 150 feet long). He had threatened to chain our bikes together, so I was trying to keep an eye on him! I decided to put my sunglasses on my bike helmet to use on the bike course. The concern was my helmet has a tinted shield. With two levels of tint, I might have trouble seeing in the underground; however, I can flip the shield around so it is still attached to my helmet (in an aerodynamic position). I decided that I would flip it just before entering the underground. About 5:40, Kevin stopped by and we left for the swim start. Sunglasses on the helmet and I placed my regular glasses in the shoes I wore over to the race. Wetsuit, clear goggles, and navy blue swim cap in hand. This race is HUGE. 7,000 total participants among all events (although, it appears only 6,000 were on the results). It takes four hours to launch every wave. Pros, International, then Sprint. Pros at 6am. Kevin at 6:44am. Catie at 7:18, Erik and me at 7:26, Kyle at 7:34. Rex was doing the Sprint, so he was an hour+ later. Just crazy how long it takes. That time difference means the first waves could have a completely different race, weather-wise, than the later waves. Kevin and I watched the pros swim by like fish and then I left Kevin for his start so I could use the port-a-john for the last time. After that visit, I finally caught up with all of the rest of the crew (athlete and support). Rex, Catie, Kyle, Erik, Dork. Eventually Erik and I lined up in our queue. 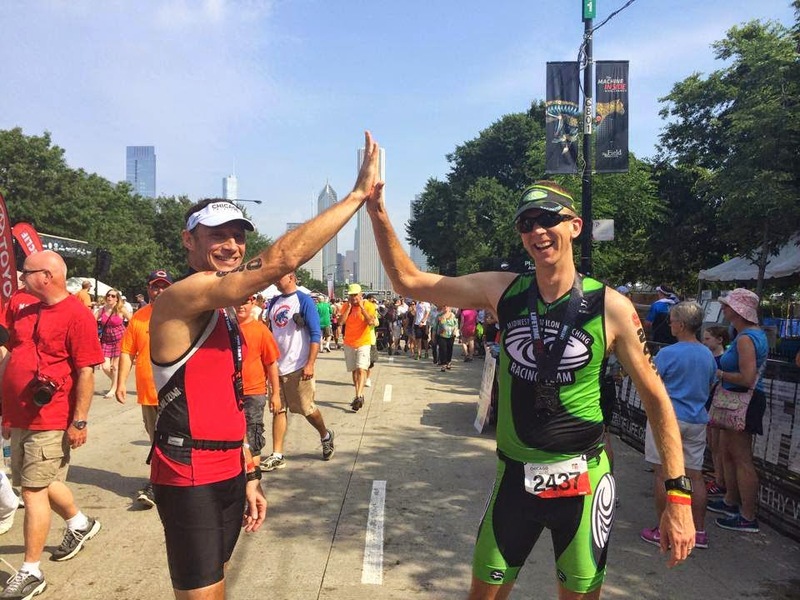 I love how in my last few major events I've had a friend to high five just before the start. 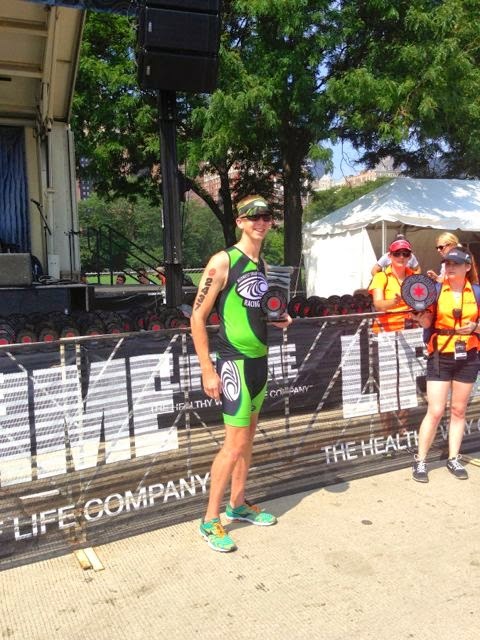 JoeVI at Chicago Marathon and Beach2Battleship 70.3, Vicki at Beach2Battleship 140.6, and now Erik! Erik and I getting psyched! 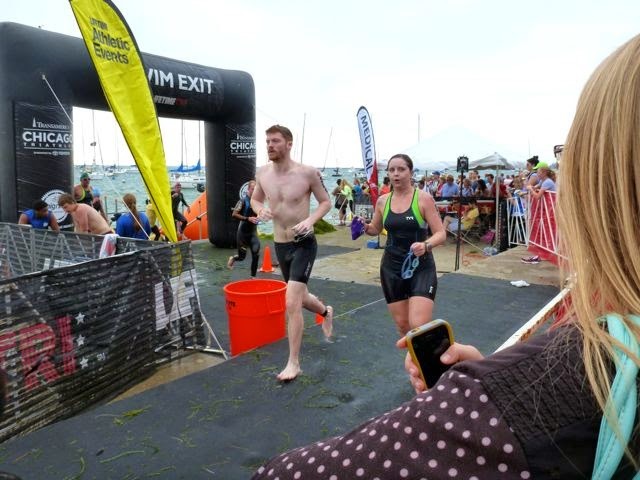 Before Catie's wave was released, the announcer mentioned her (after some prompting from Deb) as it was her first triathlon. That was pretty sweet! Before too long, Erik and I were in Lake Michigan and ready to start! I tried to position myself so I'd be near the front of the group but after everyone filed into the water, I got stuck about 4 rows back. We were packed in like sardines, for lack of a better analogy. If we immediately started kicking, I'd surely get a toeful! Once the horn blew, everyone had the same idea of doing the old-lady-don't-get-my-hair-wet freestyle swim. After about 20 feet, I finally got horizontal and fought my way to even more open water. It felt like 200 yards before I got comfortable. 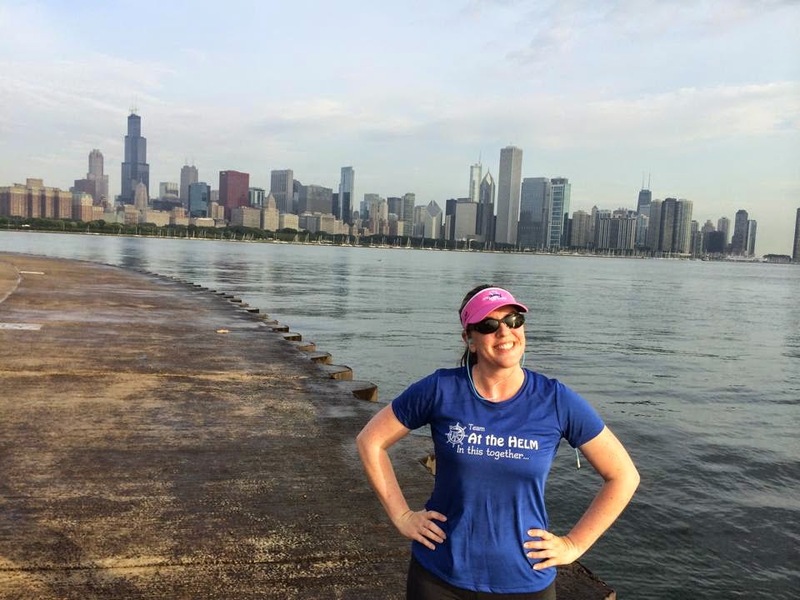 We swam south about 380 meters before turning around at Shedd Aquarium and swimming back 380 yards past the start. Then the remaining 750 meters to the Chicago Yacht Club for the exit. After the first 200 meters, the next 800 were pretty smooth. I felt like I was cruising along. I felt this because under the water was a farm of seaweed and it was flowing by quickly! My arms, legs, and face were getting caught in it. Nothing horrible but I was curious if I could pull myself through the water with it. Eventually my focus went to the top of the water, meaning the 2 to 3 foot swells that were coming in with the northwesterly winds. Ugh. I kept pushing myself hard but tried not to get nauseous. I was concerned about being dizzy for the run to the transition, which was a long 1/4 mile run. As I was moving along, I was passing people from the previous three waves. I stopped seeing people from my wave. In fact, TKB told me that when she saw me in the water (or who she thought was me), I was the first navy blue swim cap. I finally saw the big orange buoy that marked the swim exit and swam hard to someone to help me out of the water. They had metal stairs in the water but I did have some trouble finding a step. Once I got out, the race to transition was on! I ran passed quite a few people on the narrow stretch of carpet that marked the route to the transition. I managed to get my wetsuit to waist level. There were 9 bikes per rack with narrow aisles and so it was a tight squeeze in the transition areas. In getting off my wetsuit, I nudged my bike enough that my helmet fell and my sunglasses tumbled somewhere. Once I got my suit off and put my helmet on, I decided to grab my regular glasses instead of sunglasses, which was fine since I knew where the regular glasses were. I still had my suit in my hand. I threw it down and started to take off. The suit was going to be in other people's way. I grabbed it to move it somewhere else and froze for a few seconds. I had nowhere to put it. I could have put it on my running shoes but they would get soaked. I managed to tuck it somewhere that wouldn't be in people's way. The cool thing was I was having trouble finding a spot because all the bikes were still there. I was one of the first out of the surrounding bikes! I ran my bike through the murky mess. Since it rained on Saturday, the transition was a mud pit. I went straight for a close road and ran to the mount line. For me it was the "fail line". I had my cycling shoes attached to the pedals on my bike. I did everything as I normally do but as soon as I put my foot on my shoe, it unclipped and fell off. Ugh!!! That was the first time it'd ever happened in the countless times I've practiced it. I ran back, put it on like normal, then hopped on my bike and took off! We first went up the entrance ramp to north Lake Shore Drive, then the fun started. With the wind coming in from the southeast, I had a nice push for the first 8 miles. I was hitting 27mph+ for the first few miles. After such a choppy swim, it was nice to take advantage of that wind. As I started, the course was quite crowded. 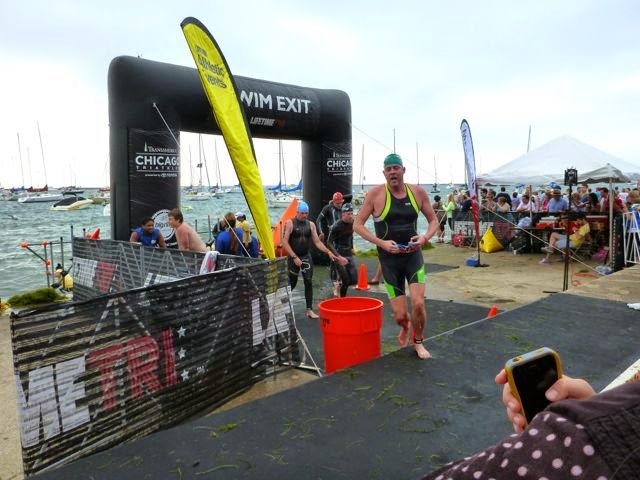 My swim wave was 20th out of 27 so there were roughly 2,100 already ahead of me. 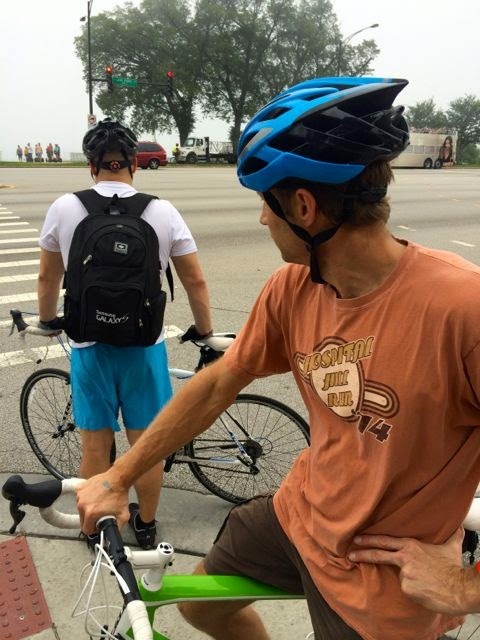 Some people had trouble following the "ride to the left, pass on the right" rule for Lake Shore Drive. I hollered at some people "On your right. On your right! ON YOUR RIGHT!" but they just didn't move out fast enough. Ride into them or jump around the orange cones for a split second? What did they say about the orange cones in the athlete's meeting?! I kept flying. According to my Garmin, my first 5 miles averaged 25.7 mph (which included my screwed up mounting). By the time we hit the first 180 degree turnaround at mile 7.5, I had yet to be passed. I took a noticeable dive in my average speed on the way back to the city though. I just kept trying to time trial like I was at the downtown airport on the windy side of the loop. Still no one passed me. There were still a lot of people who had trouble with the "ride on the left" concept. I tried my best to be a steward of USAT rules and make sure to ride there whenever I could. The PowerBar Energy Blasts were working well but I was almost through them by the time I hit halfway, which was the start of the underground section! We lowered into intermediate Wacker Drive and there was absolutely no wind, as you'd expect. When shifting, my rear derailleur, chain, and cogs makes a nice "thunk" noise. My carbon rear wheel helps to amplify the sound too. Add in a nice little echo from being underground and it gets pretty loud. At one point I shifted as I passed a another athlete. When it made the "thunk" noise, it startled her and she let out a little squeal. Sorry. I'll be more mindful (or use that as a warning for people who don't know which side of the road tunnel to ride). So far no issues with the tinted shield on my helmet but I was concerned about the busway based on the athlete's meeting. It goes in and out of daylight more often. So I flipped my shield as we circled around to the busway. This section of the course was a two-way, two lane road with no shoulders. It was pretty tight. I again struggled with some people not moving over after they passed. An open section of the busway. 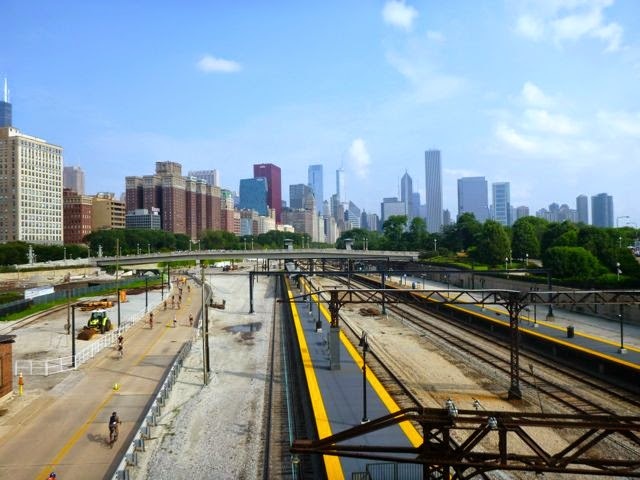 Beautiful view of the busway and downtown Chicago. After about a mile on the busway, I heard people yelling. Yes, there were people on pedestrian bridges above the busway but this was different. It was coming from the cyclists returning. Pretty soon I saw a man with a bullhorn telling people to "Slow down. Biker down". I was coming up on a downhill with a slight turn into a tunnel. Two cyclist were on the ground with neck braces and back boards. Things were getting dangerous. I slowed up a bit when the course got tight. The race did a great job marking dangerous sections of the road with orange paint/tape; however, there was one manhole whose cover was about an inch sunken down and not marked. My carbon wheels made two nice THUNKS... this time as I rode over the manhole. 2 miles to go and I thought that the pothole manhole may have just flatted my tires. I slowed my roll a bit until I was sure they were good. After a quarter mile I was confident they were fine. Pretty soon we were back on Wacker and I was preparing for my dismount. Feet out of shoes and riding in! Fortunately, my flying dismount was much more graceful than my flying mount. As I noted earlier, the transition was packed with bikes making it challenging to place my wetsuit without it getting trampled by someone's cycling shoes. This time the racks were all empty except for one type of item. Many people on my rack used it to hang their wetsuits. What?! Seriously, what are you thinking? I tossed a couple wetsuits over and racked my bike. I probably should have put my bike on the wetsuits. No real issues here. I decided to put on my sunglasses, so I took a couple seconds finding where they landed. 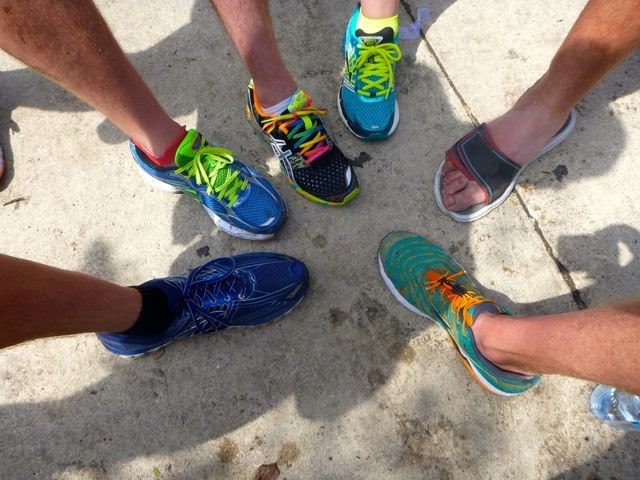 My running shoes went on just fine (no socks). I grabbed my visor and race belt and attached them on the way out of transition. Started on the cement trail but it went off-road for a bit through the grass. Fortunately, this wasn't a muddy swamp. The course was mostly flat but the heat and humidity were rising. The first few miles felt slow and they were definitely slower than I wanted at 7:13 and 7:06 pace. Again, I kept passing people and had yet to be passed since the start of the swim... until now. A female absolutely flew by me! I just postulated that she was freshly out on a late morning run as the run course was open to the public. While I couldn't see a wave marking on her leg, I noticed the sides of a bib on her shorts. Wow! I tried to pace off of her for a bit but just couldn't keep up. Just after mile two I finally saw a familiar face. Kevin was on his way to the finish line! We gave each other high fives and I was quickly green with jealousy. He was almost done and I had 4 miles to go! They had 7 aid stations on the course with water and gatorade. A couple places on the course had cold mist fans cooling people down. At one point they had a huge firetruck blowing water through a 4 foot fan onto the course. It felt great. I gladly didn't mind my temporary blindness with water on my glasses! Humidity is a silent race killer. You're sweaty from racing and the humidity makes it so that sweat doesn't evaporate. It's the evaporation which pulls heat from your body to cool you down. Lots of humidity + no evaporation = no cool down. I feel this hurt me as the 7:20s and 7:30s paces started. Hopefully it was killing the race of others in my age group. I did get passed by someone else around mile 6. This time I confirmed it was a person from my wave... another female! (My wave was mixed with Females 24 and under). As it turns out, this was the overall female winner (the previous female was from a much earlier wave... great runner, not so great swimmer/cyclist). Pretty soon I was heading up towards Columbus Drive. 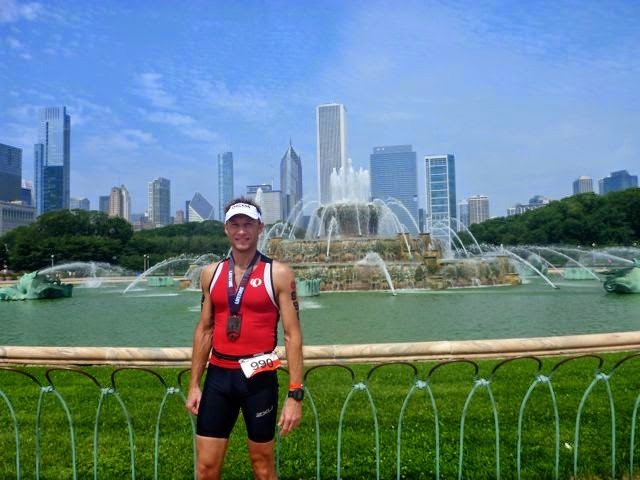 This drive was the home of another finish line I had experienced, the 2012 Chicago Marathon. I could hear TKB and family cheering for me. 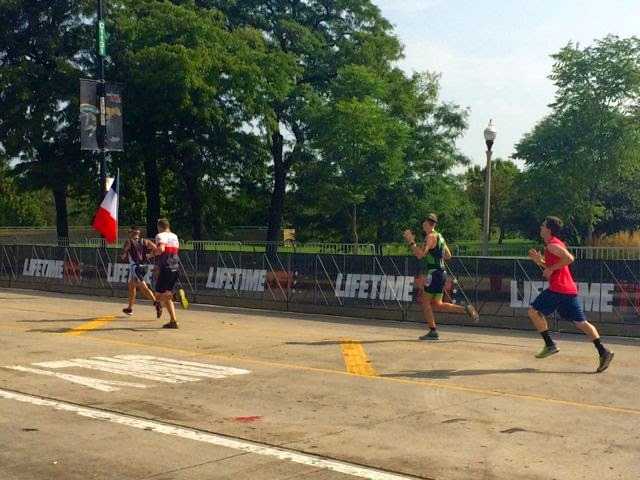 I was trailing a few people but none in my age group so I enjoyed the finish! Waving as I went by! I meandered through the finish line and grabbed a couple yellow-flavored something-ade bottles. I got a nice ice cold towel and threw it over my head (making me think about the silly ice bucket challenges). I didn't have my cell phone with me, so I wasn't sure how to get ahold of TKB and crew. Kevin found me in the post-race festival area and we chatted about the race. Deb caught up with me and loaned me her phone so I texted TKB where to find me. Once TKB and my parents stopped by, I decided to go check the race results. By now 12 minutes had passed that represented the 3 waves of my age group start (3 waves starting 4 minutes apart). My position should be finalized by now. After walking and waiting in the line, I typed in my bib number. While thinking that the only people to pass me were the two females and the fact that I don't remember seeing someone in my age group, my eyes went directly to one column on the race results: "Division Place". I read it three times and every time it said "3"!!! 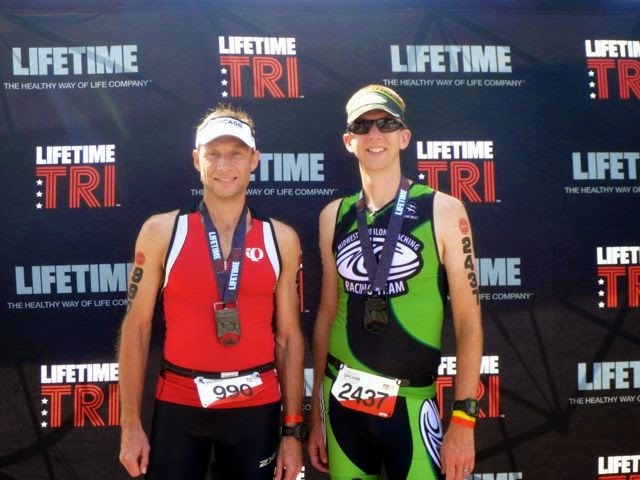 My first triathlon podium! I couldn't believe it. I knew I had a shot but I figured with heat/humidity I thought I had lost that chance. I didn't get a PR but I hit my goal! Pleased with my podium but not thrilled that in three international triathlons this year, I've gotten slower each one, mostly due to the run. Each race has their own spin, such as this having a 1/4 mile run from swim to transition (which put this behind of Kansas 5150 time). The next day my lower back was sore. I think I need to get back in the weight room to strength that up. In addition, I'm frustrated that I can't keep a good pace on the run if I'm not in marathon running shape either. I ran a 6:44 pace 10k at KC Tri a month after the Louisville Marathon. Things to keep in mind as I start my ironman training next year. Yes, heat and humidity is a factor but I don't think it was that much different than Kansas 5150. There might also be a direct corollary that as my bike split improves, my run split suffers. 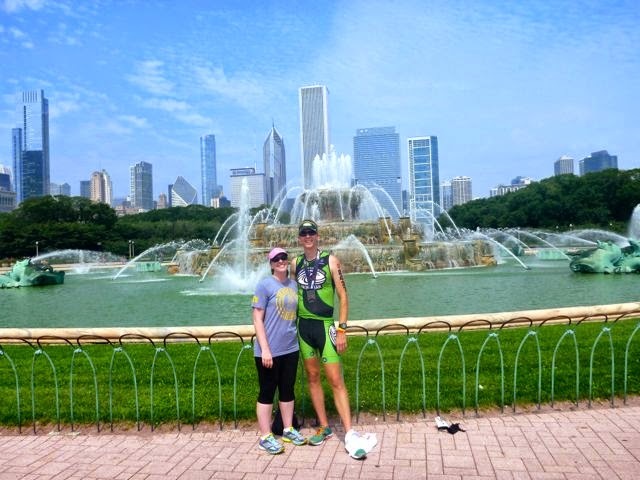 Congrats to Catie and Rex for finishing their first triathlon! 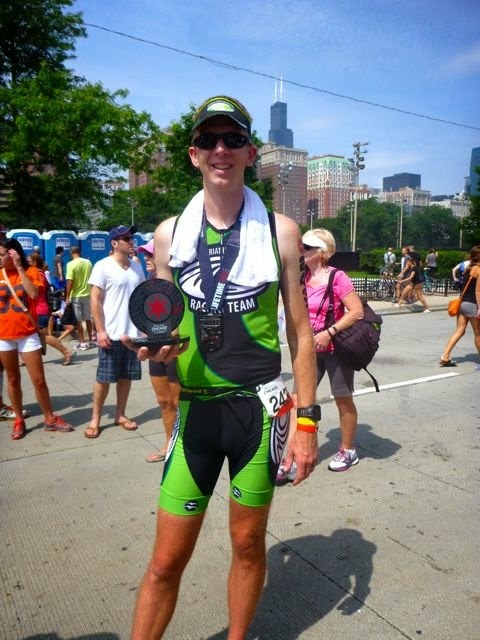 Kyle finished his third Chicago Triathlon and used his ninja bike maintenance skills to fix a broken front derailleur while on the bike course. (By "ninja" I mean rip off the broken piece and chuck it like a Ninja Star). Kevin pulled in a strong showing and had a fabulous finish. Mad props go to Erik for knowing when it's just not your day. Coming off of being sick and still having some chest congestion, Erik pulled out during the swim with problems breathing. As in, not being able to breathe is a big problem. I feel bad for him as I know he really wanted to do the bike course and race in his favorite city. I know he'll be back and have a stellar race. I'd love to be there to support or race with him too! 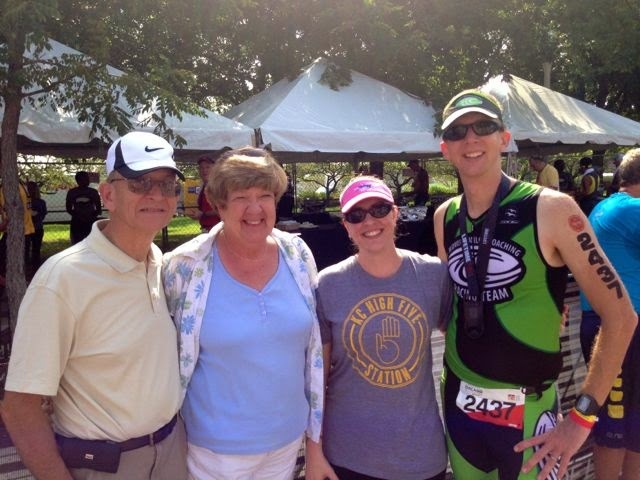 Thanks again to TKB, Mom, and Dad for being out there to support me and be part of the entire weekend. I love having family around to share in the experience. I realize it's extremely exhausting and nerve racking to spectate at these events, so I greatly appreciate it! 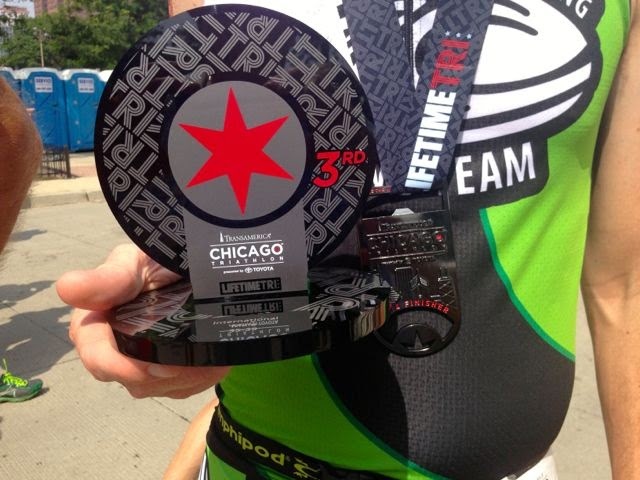 Also thanks to Coach Ken Welsh of Midwest Triathlon Coaching for helping me to this 3rd place podium. I need to extend thanks to Coach Doug Hayden as well. He teaches the Masters Swim Class I attend as often as I can. I've seen some great swim improvements this year thanks to him! 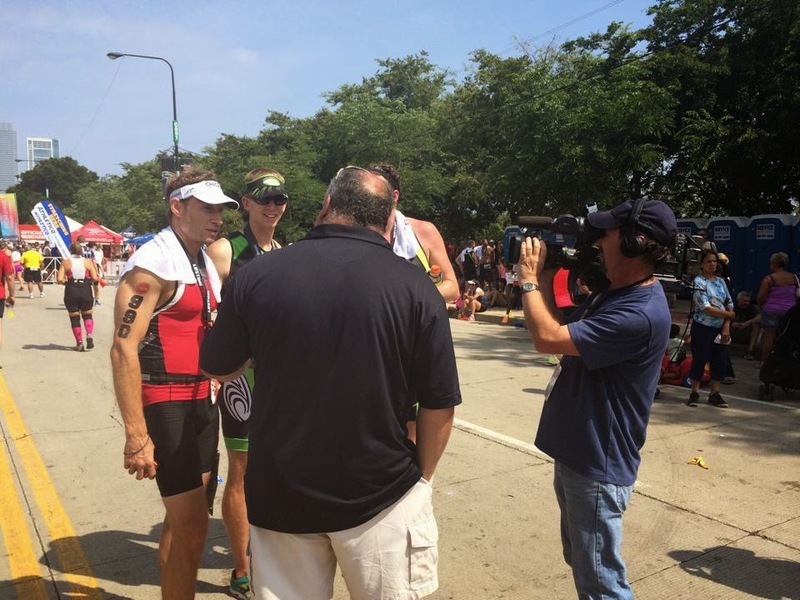 I thought I had a shot at a podium earlier in the year but the one thing that concerned me was this year's Chicago Triathlon was the USAT Club National Championships. That upped the quality of athletes. This added 25 males in my age group; however, none of them made it to the podium. Maybe I should start taking offers from local USAT Clubs? The bike course is very sweet and very fast. I don't know what the previous course was like but having no wind to contend with on the underground proved exactly how fast it can be. I was concerned the air would be stagnant but that wasn't the case. Apparently the section where I came across a bike accident had multiple incidents. Kyle saw other cyclist being loaded into an ambulance as well. Somehow we got asked to be interviewed for a possible video for next years race. Hopefully my less than elegant responses don't get our chances cut on the editing room floor. Close-up of the award and medal. Catie exiting the swim with Kyle peaking around the corner of the Swim Exit arch (in his green swim cap). Kyle heading towards transition... somewhere off into the distance! A nice little backside shot... if you look closely, on my left cheek Brodie sent me some good luck by chewing a few holes into my tri shorts. Thanks, pooch. I expect this to be on Kevin's Facebook cover photo shortly. Giving out some KC High Fives in Chicago!